I personally don’t do massive amounts of downloading, but as I am a user of the fantastic Steam game download service, it has made a marked difference between the time it takes to purchase and then be actually playing the game. I also do a lot of online gaming both on the PC (World of Warcraft) and on my Xbox 360. 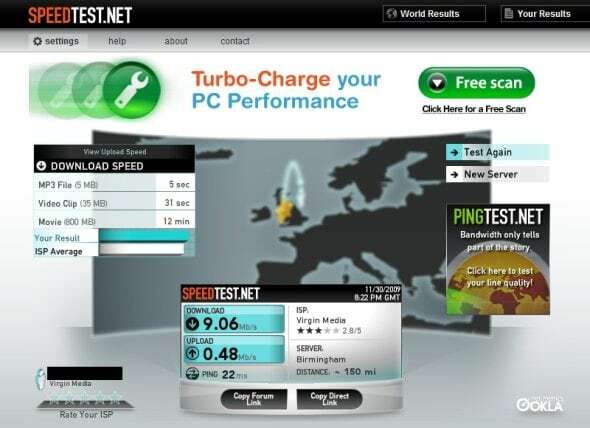 As the ping to my server based in Birmingham is always around 20ms there is rarely any lag on games I land in and when playing on Xbox Live, 9 times out of 10 I will be the designated host. This makes killing those trash talking noobs that little bit easier! When I signed up to Virgin Media’s broadband service I was given an installation time within the week and all the equipment for free! For this I had to sign up to a 12 month contract but did not have to sign up to anything else. This meant I got to steer well clear of their other TV service and phone line services, a real bonus as I’m not a fan of those! This is definitely how all services should be. You should be able to pick the best bits from all service providers and leave the bits you don’t want. I’ve not had any reason to call the Virgin support line since I had it installed, the only people I have talked to were the UK based sales team. So I decided to give there tech team a call with a hard to solve and 100% made up problem (I unplugged the modem from the computer). I had to punch some buttons on audio menus to get through to technical support and was finally put through to a delightful person called “James”. I had suspicions that this might have been a made up name as James had a very strong Indian accent. My super keen detective skills were confirmed when I asked “James” where he was located and it turned out to be an Indian based call centre. But, credit is awarded where credit is due, he pinged the connection and diagnosed that all their equipment was working fine in under a minute. “James” then took me through the very complicated steps needed to re connect my LAN cable back into my PC. Mind boggling! So, it all seems sweetness and roses up to this point and now you want to hear the bad points right? Well, let me tell you…. I have not found one yet. The only bad point I can see is that it is only available to limited people based on where they have laid the cables, ie larger urban areas. So if you live with your banjo playing wife/sister out in the sticks, then you probably won’t have access. However, if you want to see if it is available then you can check by entering you post code on the Virgin Media website. Virgin Media also use Google Mail for their customers’ email needs now too, which as far as I’m concerned is only a good thing as Google’s webmail service is the best out there and means their customers can easily access their email wherever they happen to be. So, after my “extensive testing” and in my very dubious “expert” opinion I can see no reason why (if available) you should not switch to this fantastic service. I don’t normally like…anything really, but I cannot fault Virgin Broadband for service or value and with speeds nationally of up to 50 MB/s this will definitely satisfy even the hardest of download fiends.